Rumsey Environmental provides clean and sanitized toilet rentals with professional and dependable service. 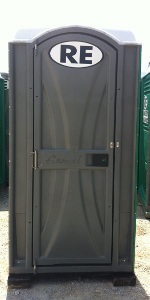 We have an extensive inventory of quality, ADA compliant portable restrooms for job sites and special events. We deliver in the Tuscaloosa area where temporary bathroom facilities may be needed for industrial or commercial work sites, residential construction or events, or neighborhood and community events. Along with porta potty rentals, we also offer temporary fencing, hand wash stations and fresh water tanks for your convenience of setting up the portable sanitation facility at your site or event. Enter your information to learn more about portable toilet rentals in your area.